Tuesday night's storms knocked down hundreds of trees in Cascade, a village in Sheboygan County that's not even one square mile in size. Volunteers spent most of the day Wednesday helping residents clean up the mess. "We got lucky, we’re really lucky," said Harold Haas, a resident of Cascade who says the storm took out a large cottonwood tree in his front yard, but only caused minor damage to his house. "[Took] my antenna, so now I gotta find a place to watch the Packer game," he said. After hearing the sirens, Haas said he and his wife hid in the basement to wait out the storm. "I could just feel the house shaking, I thought the house was going," he said. "I thought it’d be a lot worse. Thank God all the trees that are down, no ones really got damage to their house, it’s amazing." 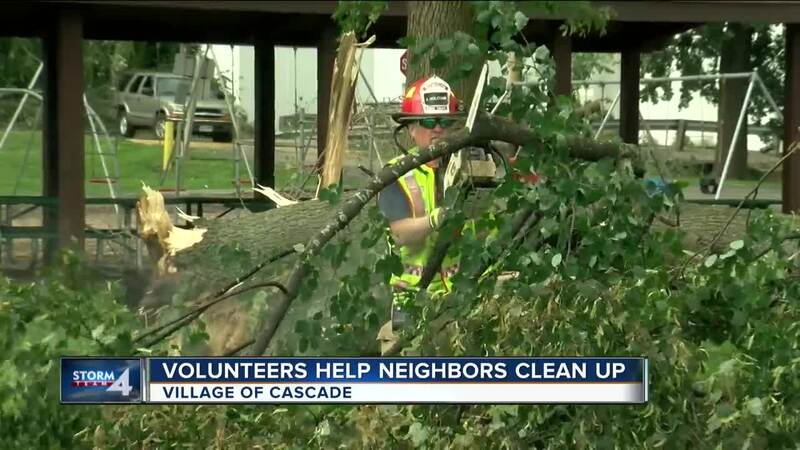 Cascade Police Chief Jason Liermann echoed that statement, saying the storm knocked down hundreds of trees but only slightly damaged homes and vehicles. "We were very fortunate, no injuries as a result of that storm," said Liermann. Officials say thanks to the efforts of volunteers and local fire crews, all the primary streets in the village have been cleared. Portions of the village are still without power and Liermann is still asking people to avoid the village for the time being as clean up efforts continue. A more thorough assessment of the damage will take place on Thursday. Officials will then determine if more volunteers are needed. Wednesday, Aug. 29--Riverview will be open until 1 p.m. Plymouth High School will be open until 3 p.m. and will reopen 6-8 p.m.
Thursday, Aug. 30 and Friday, Aug. 31-- Riverview will be open 6 a.m.-8 p.m. Plymouth High School will be open 6 a.m.-3 p.m.
For any further questions on those showers, please call (920) 892-2661. Further updates on storm damage in Sheboygan County can be found here.